It was a little bit slow starting at the SECC on Sunday, I hate standing around twiddling my thumbs so I started to have a play. I could see Tony doing the silent tutter "what is she doing now!". 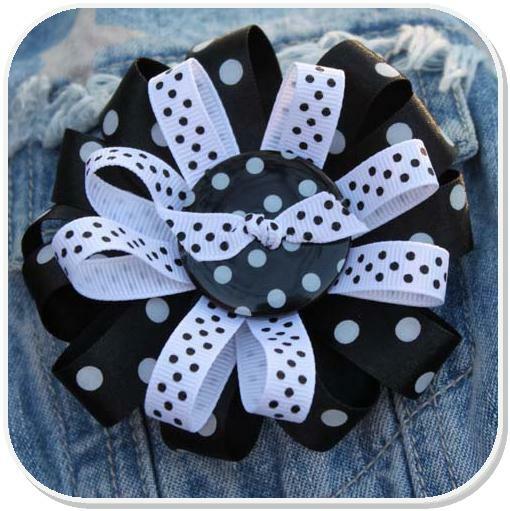 A little wander around the stand - grosgrain black and white swiss dot, ummmm a large black and white spotty button, ooooh the polka dot ribbon also in black and white. Perfect just what I needed. Pop back they did, I was asked to put together enough ribbons and buttons for a workshop of 50 ladies - they wanted bright Easter colours. 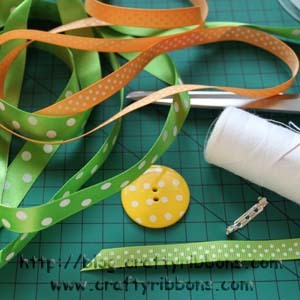 Rather than all making the same colour brooch, I chose, orange, lime and yellow in each of the ribbons and buttons, so that they could mix and match all the ribbons and buttons together and come up with some super colour combos. 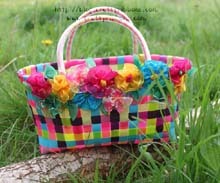 I hope you all enjoy your workshop ladies in Bishopbriggs this weekend. 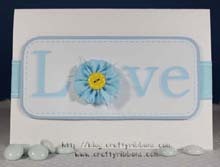 All throughout the day I was asked how I made my brooch, so in the end I said it would be this weeks Hello wednesday project and that I would do a tutorial - so here goes, it is a long one, but I wanted to make sure I missed no stages. 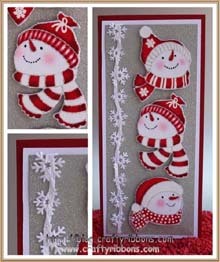 Regular readers of the blog will notice this is very simiiar to the football card I made last summer here. 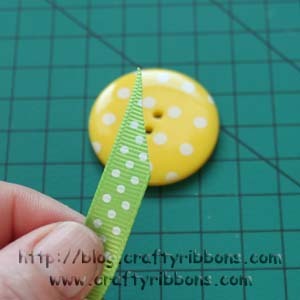 Gather all the bits you need together - scissors, needle and thread, blue tack, brooch clasp, large button (here), 10mm grosgrain swiss dot ribbon (here) and 15mm polka dot ribbon (here). Cut the ribbon which is going through the button to a very fine point. 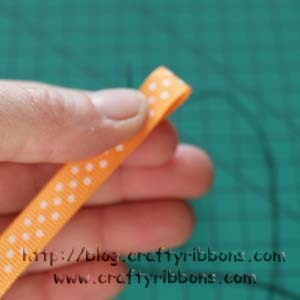 This makes it easier to thread through the button holes. 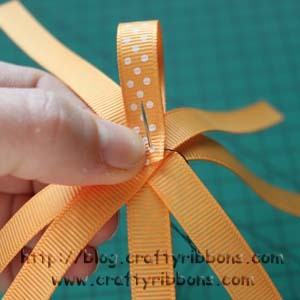 Thread the ribbon through the button. 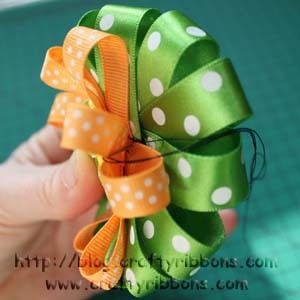 Play with the ribbon slightly so that the spots are on the outside facing edges. 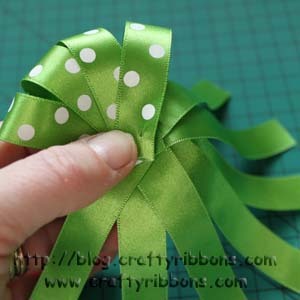 Tie a single knot in the ribbon to create a simple bow effect. 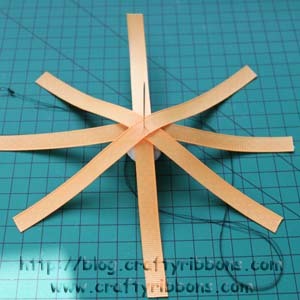 Cut the ends at an angle. 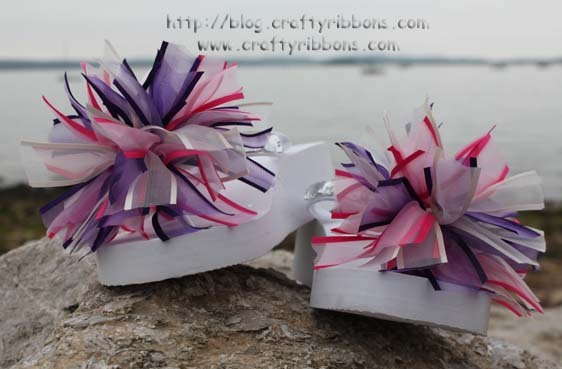 Cut your ribbons. 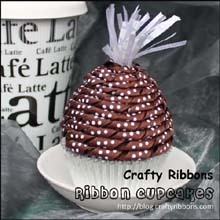 You need 4 x 10mm ribbons at 18cms each and 6 x 15mm ribbons slightly longer at 20cms each. Thread a needle with matching thread - I have used black so you can see my stitching. 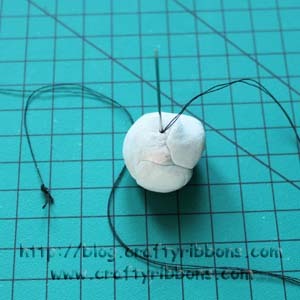 Put a knot at the bottom of the thread, give it a tug to make sure it is secure. 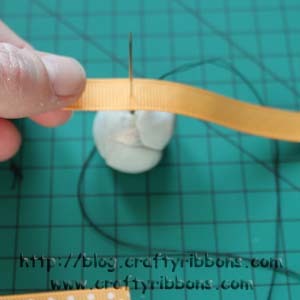 Place the eye of the needle into a lump of blue tack (you do not have to use blue tack, but I find it helps). 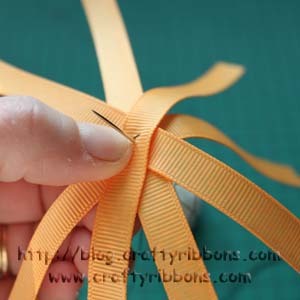 Fold a piece of 10mm ribbon in half to find the centre and press with your fingers to create a fold mark. 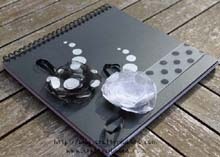 Place the centre fold onto the needle, so it rests on the blue tack. 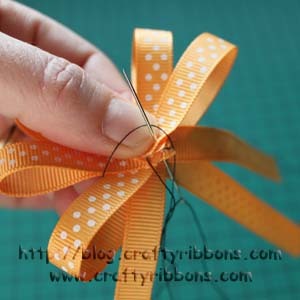 Place all 4 pieces of ribbon onto your needle so it looks like this. Pull the needle up through the ribbon. 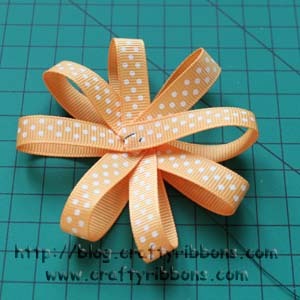 Gently lift the ribbon and secure the centre of the rosette with a few stitches. 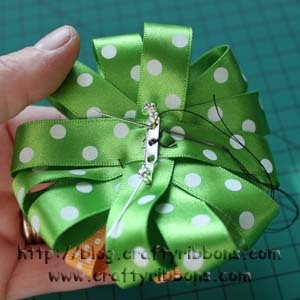 Bring one of the ribbon ends (does not matter which one) to the centre and secure with a stitch. 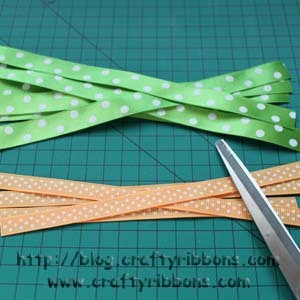 Repeat with each ribbon end. 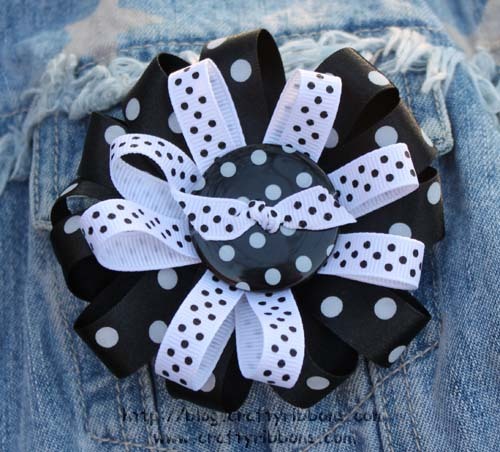 Sew the button on top of the rosette, go up through one of the button holes and through the ribbon, then back down through the same hole, repeat with the other hole. You could always glue this together if you wish. 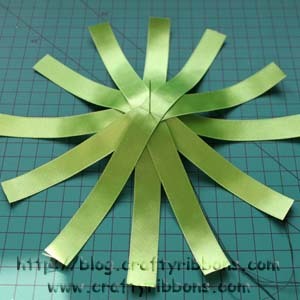 Repeat the rosette making process with the wider 15mm satin ribbon, this time you have 6 pieces of ribbon. 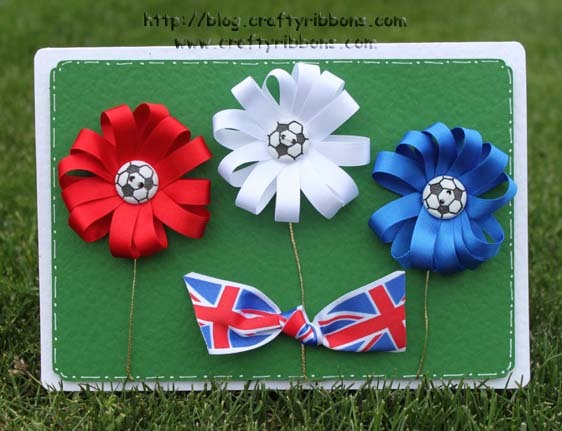 Fold your ribbons over as before. Finished outer rosette. 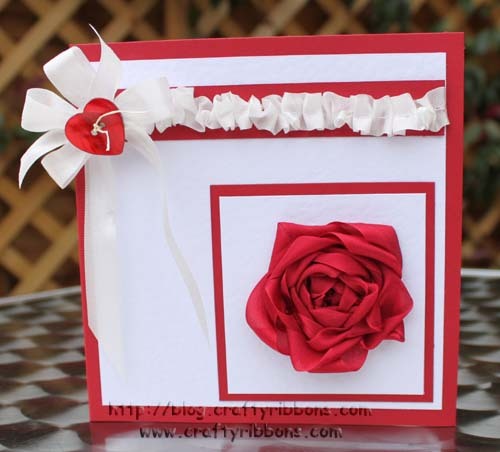 Because the ribbon is wider and you have more ribbons, the rosette will be fuller. 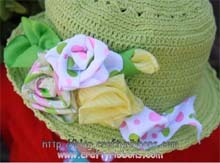 Place the two rosettes on top of each other and sew together making sure they are secure. Once again you could glue together. 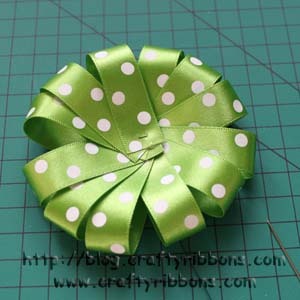 Sew a brooch clasp to the back of the rosette. 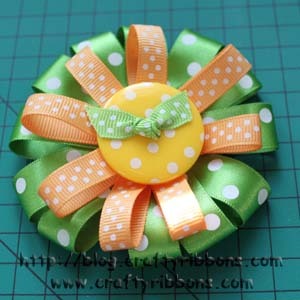 One finished Easter Rosette Brooch. This little creation pleased so many people on Sunday, that we were putting different colour combos together most of the day. Each brooch works out to be less the £1.40 for the ribbons and button, you can find the brooch clasps for about 25p each. 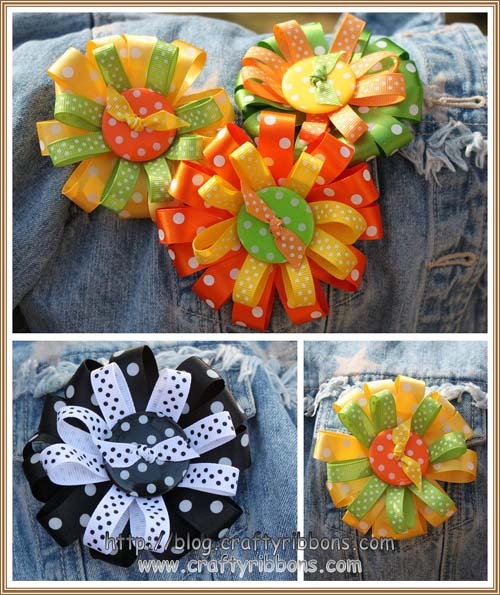 Just think you could have a different coloured ribbon brooch for every jacket at that price!!! 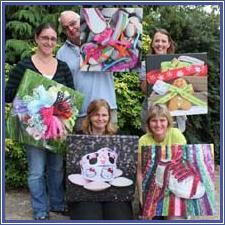 Show off your creations, wear them with pride. 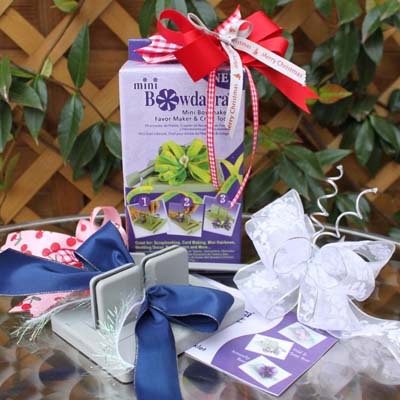 Anyone coming to see us at either Olympia or the NEC during the next two weeks wearing a ribbon brooch, will be able to pick a FREE bag of ribbon from our stand. I will be wearing mine. 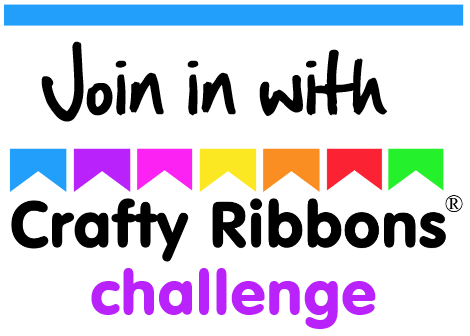 Go on - wear some ribbon today and make people smile!